I have the most beautiful thing in the world. More beautiful than a sunrise over a lake, a sunset over the Grand Canyon, my unborn children, etc. Holographic nail polish. I'm a nail polish amateur, but I do have a bone to pick with the nail polish world. Why. Didn't. You guys tell me about this sooner? It blows my mind! Sure, I've seen some pictures of holographic nail polish, but the opalescent effect just simply isn't captured well on camera. It's stunning! 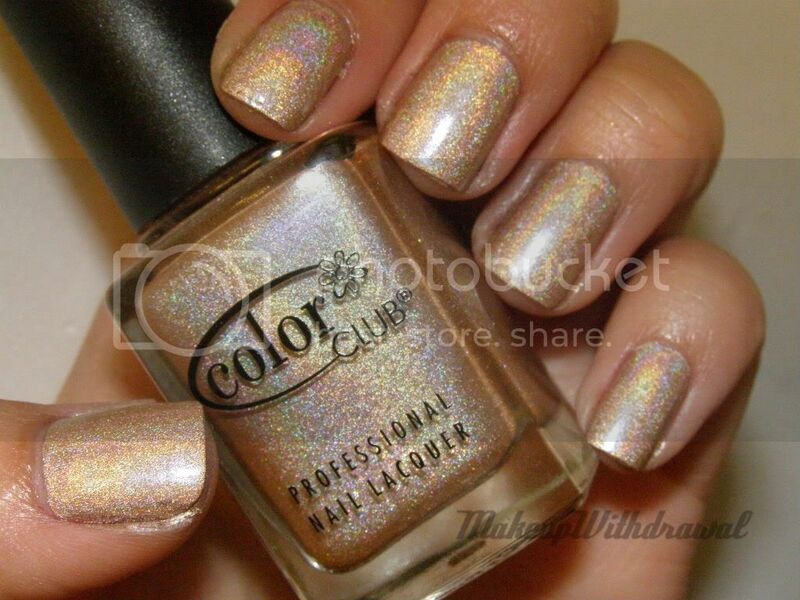 The one I have on today is from Color Club, it's called Love 'Em Leave 'Em. It's a beige, but boy it couldn't be anything further away from boring. The interesting thing about this holo (and I guess all holos? I wouldn't know, I only own one!) is that it's formula applies like it's matte. The reflective qualities make it shiny again. Kinda odd, no? I would top it off with Seche Vite, but I found that it actually dulls down the shimmery rainbow-y goodness, refraction at work. It took only two coats to achieve this effect too! And without a top coat, it lasted a pretty decent amount of time, 2 days (this is more impressive than it sounds, I abuse my fingertips and get way more wear'n'tear than the average person). Let's just say that I will be, without a doubt hunting down more holos! What do you think of holos?